Home / Auto-Assignment/Agent Availability / What is Agent Availability, and how can it optimize my team’s workflow? Availability is determined by a combination of your Auto-Assignment settings and your Agent Availability settings. The Auto-Assignment algorithm is designed to optimize Agent efficiency and reduce end user wait time. The factors taken into consideration are the Agent Issue limit as set by your team, and the amount of time that has elapsed since the Agent last worked on an Issue. Since the overall objective is to reduce end user wait time, if one Agent is more productive than the others, that Agent will be assigned more Issues than other Agents as long as their limits are not exhausted, which is why we refer to it as a load balancing feature. 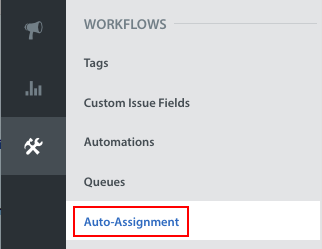 Admins can manage all of your team’s Auto-Assignment settings on Settings > Workflows > Auto-Assignment. To toggle these settings for individual Groups, you’ll need to use Teams. The Teams feature is typically only used for very large enterprise organizations. If you’re interested in learning more about Teams, please reach out to your Account Manager or success@helpshift.com. Auto-Assignment is designed to work with Queues, a feature which can be unlocked with an upgrade. Please reach out to your Account Manager or to success@helpshift.com to determine if Queues is a fit for your team’s workflow. For a brief overview of Queues, please see What are Queues, and how do I use them? Under ‘Availability’, you’ll see a toggle for allowing your team to set their availability to respond to Issues. When enabled, the Away toggle allows Agents to mark themselves as Available or Away. When an Agent marks themselves as Available, this means that they are available to receive new Issues. When they mark themselves as Away, they are not available to receive new Issues. This toggle can be seen in the bottom right corner in the Agent Dashboard view. In addition to the toggle above, Agents can indicate in their Account Settings whether they’d like to automatically be marked as ‘Available’ upon login. Simply click the profile icon in the bottom-right corner and check the ‘Availability’ box. 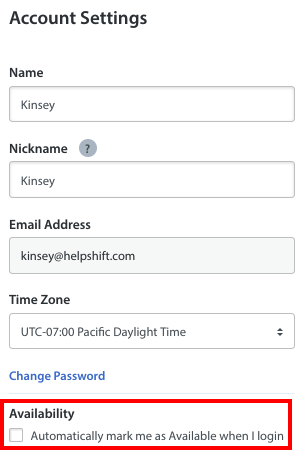 Once you’ve set up your team’s availability settings, you can use Real-Time Operations to monitor your Team and Queue performance during work shifts. To learn more, see What is Real-Time Operations, & how do I use it?